Wedding Bride in White Dress Dancing at Beach. Slow Motion. 주위에 흰색 웨딩 드레스 회전에서 아름 다운 젊은 신부. 그녀의 결혼을 축하 행복한 신부. 슬로우 모션 비디오 영상. 매력적인 젊은 신부를 돕는 신부 들러리는 결혼식을위한 준비를합니다. Happy groom hold on hands his bride in white wedding dress and turning around. 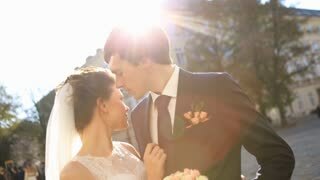 Newlyweds enjoy sunny day. Slow motion. Beautiful bride walking outside before wedding ceremony. Woman stops and turns around in wedding dress. Slow motion.